For more photos from House, M.D. click here or go to the www.fox.com website. It’s a detective show with a twist. It’s medical. In each episode of the television drama HOUSE the maverick, irascible, insensitive, yet brilliant Dr. Gregory House (Hugh Laurie) and his crack team of Physicians confront puzzling medical mysteries. But the real edginess of the series comes as much out of the character-driven aspects of the show as it does from the medical conundrums. Dilemmas of each episode take a triple approach: the mystery disease, the eccentricities of the central character, and the conflicts of other cast members as the experience House’s almost sociopathic attitude toward the lesser mortals around him. In the same vein (minus the sociopathy), Set Decorator Danielle Berman, SDSA and Production Designer Derk R. Hill tackle a myriad of design dilemmas each week, joining forces to research, sketch and construct the shows striking sets. “less than a week! That’s the amount of time we usually have to determine the look and style of the new sets,” discloses Berman. “After establishing the palette and concepts, we will refer to our research to find appropriate spaces with correct foliage and architecture, and then fill them accordingly. Most of House takes place inside the Princetom-Plainsboro Teaching Hospital. The fictional medical facility is located in Meteor County, New Jersey, the same part of the country where executive producer, Bryan Singer attended high school. “los Angeles looks very different from New Jersey,” says Berman. We made two trips east to scout the campus and the surrounding areas to document the architectural styles, landscapes and environments of Princeton, and refer to this research all the time. Since Princeton-Plainsboro Teaching Hospital is supposed to be state of the art, Berman must dress the sets with the most up-to-date equipment. “not only does it have to look great, it has to be appropriate for the medical procedures conducted in each episode,” she notes. Luckily Berman has some expert medical assistance. “I have the luxury of having two sisters in the field, one a pulmonologist. 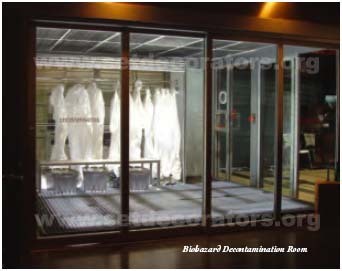 Berman has also established relationships with companies who manufacture and distribute advanced medical equipment. “They’re often happy to send us the latest products on the market,” she says. “An example is the SOMOTOM Definition, the most advanced CT scanner in the industry, the first to use two x-ray sources and two detectors at the same time. We acquired the machine and featured it on the show before it was even on the market. 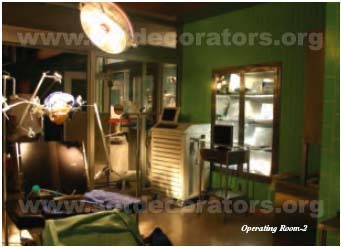 In addition to adding high-tech gear to the show’s permanent sets, Berman has also designed furnishings and acquire original artwork to further Hill’s vision for the hospital. “We commissioned artists to create abstract works in the hospital’s palette. Therefore, the artwork almost blends into the architecture,” she point out. 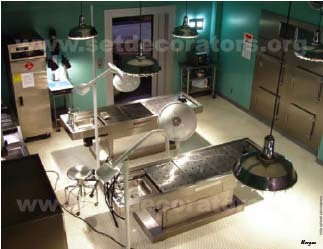 For scenes taking palce outside of the examination and operating rooms, Hill and Berman have created sets that help mold and shape the character’ personalities. “Dr. Gregory House is eclectic, with diverse tastes and interests,” describes Berman. “So his office and home reflect his personality and hobbies. They contain a mix of deco and mid-century modern pieces, early American antiques and old medical equipment.” From the high end sound system and antique kilim rugs in House’s home to the Eames lounge chair and red tennis ball in House’s Office, Berman detailed and layered the House’s world. She’s taken the same approach with the other characters’ offices, including that of Dr. Lisa Cuddy, the hospital administrator. “We really changed her look the most,” explains Berman. “Her space is so different from any other in the hospital. It is much warmer and feminine, with a stylized mission look that is unique to her character. 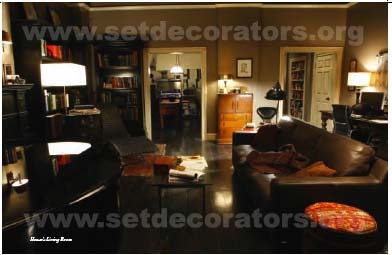 Hill’s distinct vision for the hospital and Berman’s inspired work on the show’s diverse spaces have set HOUSE apart from the competition and resulted in some high praise from their peers, including an Emmy nomination for Outstanding Art Direction. Editors note: Set Decorator Cindy Carr, SDSA and Production Designer Mark Hutman initiated the series, establishing a specific look for the show over the course of 23 episodes. 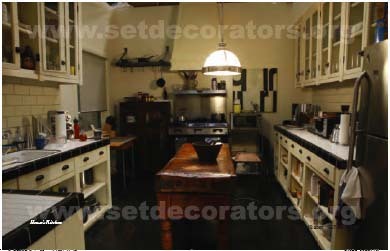 In subsequent seasons, different aspects of each character were brought forth, thus there are layers of personality and decoration on some sets and complete re-dos on many others. 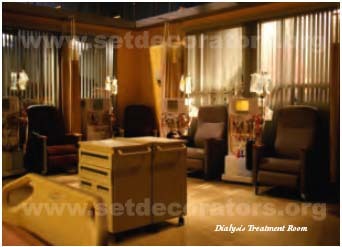 A hospital wing's worth of new medical sets have evolved along with each of the characters' offices and domiciles.